Members of the gang were caught on film as they made their escape, chased by family members. An elderly female has been left shocked and traumatised after being attacked and robbed by masked raiders who broke into her home. 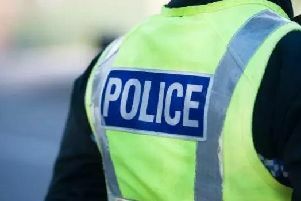 The well-planned break-in took place in Rouken Glen Road on Monday (April 10) around 5.30pm when the gang, armed with knives, forced entry to the house through the patio doors after first cutting the phone lines to the property. They then proceeded to ransack the home, stealing a sizeable amount of cash, house keys and other valuables before ripping out a CCTV hard drive, which was later recovered from a neighbours garden. The victim’s son-in-law told The Extra: “Luckily a cousin and a nephew came around quite by chance, found what was happening and confronted the gang. They then chased them outside where a car was waiting for them on Rouken Glen Road. “As they tried to make their getaway my cousin managed to take some pictures on his telephone of these robbers and their car. Detective Constable Craig Faskin from Giffnock Police Office said: “This was an extremely frightening ordeal for this woman who was within her own home and those responsible must be caught. “Officers are still gathering information on this crime and establishing exactly what was stolen from the house and the exact circumstances surrounding the crime. “Rouken Glen Road would have been very busy around the time of this robbery and I would urge any witnesses who have not yet spoken to police, or anyone with information that may assist our ongoing investigation to contact Giffnock Police Office through 101. A police spokesman also confirmed that two of the three men got into a dark grey coloured Volvo car driven by a fourth man. The third man made off on foot, and both he and the vehicle were last seen making off in the direction of Eastwood Toll on the southside. The suspects are described as all wearing dark coloured clothing but no other information is available is currently available.